It's so rare that a gimmicky product turns out to be any good. And let's face it -- most of the so-called BB cream products on the market here in the U.S. are nothing more than gimmicks. They're glorified tinted moisturizers, but because there's so much hype surrounding true Asian style BB creams, American companies try to jump on the bandwagon. Don't get me wrong -- there are a few good ones (the Smashbox Camera BB Cream is one of my favorite face products) but for the most part, I've given up even trying any of the American versions. 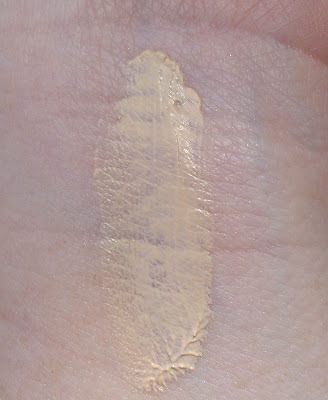 When I saw Tarte's entry into the BB "cream" market, though, I was kind of intrigued. I'm a big Tarte fan, so maybe I'm willing to give them the benefit of the doubt when I wouldn't with other brands. Or maybe it was the fact that while Tarte uses the "BB" designation, they don't actually refer to their product as BB cream. And really, if you take away the "BB", Tarte is pretty honest about what their BB Tinted Treatment 12-Hour Primer SPF30 is. And it's actually a really good product. In many ways, the BB Tinted Treatment Primer is a traditional foundation primer. It contains silicone so it has a silky texture and fills in pores and fine lines. It definitely creates a nice, smooth canvas to put your foundation over. However, what makes it different than pretty much every primer I've ever used is its tint. Now, I know that there are plenty of green, pink, yellow, lilac and even bronze tinted primers on the market but the difference with the Tarte BB Tinted Treatment Primer is that it's tinted to match your actual skin tone. That means it comes in four shades - Fair, Light, Medium, and Dark. Of course, I chose the lightest shade. While I wouldn't say that the primer has particularly good coverage, it definitely make a difference in the appearance of my skin. After I apply it, my skin just looks clearer. Of course, my freckles, acne marks, and old scars are still visible but it really does a pretty impressive job of blurring the discolorations to create a nice even complexion. If you have pretty good skin to begin, this primer may be the only face product that you need. I've worn it alone a few times when I was just running errands like taking Brownie to the vet or grocery shopping, but mainly I use it under lighter coverage foundations to give them boost. I also like it under mineral and powder foundations. Tarte also says that the primer's coverage is buildable and I can see that being true. I just find that if I put too much of a silicone-based product on my face, it feels a little heavy so I haven't really experimented with multiple layers myself. Tarte makes several pretty lofty claims about the product, actually. First of all, they say it's a 12-hour primer. That could be true, I suppose. Personally, I've never noticed any difference in how long my makeup lasts no matter what primer I've used. I use them primarily to smooth the skin so my foundation goes on more easily. Tarte also claims that its proprietary blend of natural diamond dust, plants, and lipoamino acids minimizes the appearance of fine lines, wrinkles, and pores while improving the appearance of skin luminosity. It's not clear but I assume that they're referring to long-term results -- as opposed to just when the primer is actually on your skin -- because they cite a couple of studies where women reported less visible pores and fine lines after 4 weeks. I haven't noticed any of that, but in all fairness, I don't use the BB Tinted Treament Primer regularly enough to really say. In general, though, I'm always skeptical of those kinds of claims. If that's your main reason for buying this product, I'd probably say save your money. Tarte also calls the product an "oil-free moisturizer." It is oil-free, but I don't really feel like it offers much in the way of moisture if you have normal to dry skin. Oily-skinned folks might find the hydration sufficient, though. One thing worth pointing out about the primer's "treatment" properties is that its SPF30 broad spectrum sunscreen is all-natural, which means if you're sensitive to chemical sunscreens as I can sometimes be, you don't have to worry about the product irritating your skin. The BB Tinted Treatment Primer retails for $34 and the tube contains 1 fl. oz. You can get it at Sephora or Tarte's website. I really like this product and can see myself repurchasing it when I use up the tube. If you're in the market for tinted primer and don't mind silicone-based products, I definitely recommend giving this a try. Have you tried Tarte's BB Tinted Treatment Primer? Have you used another tinted primer? I have tried this and I am a convert! most primers do nothing but clog my pores with all the silicone and cause breakouts...and I've never noticed a difference in keeping my mineral foundation even all day. it would all just disappear in the t-zone area like when I didn't use a primer. this must have fewer cones or something, because i'm not breaking out. I use a really small dot on the back of my hand and tartes big fluffy foundation brush and apply mainly down the center of my face and buff out. then I use my foundation (either everyday minerals or l'oreal true match lumi if I am in need of hydration. I have experimented with both foundations WITHOUT using the BB cream, and I DO notice a difference in the staying power of my foundation coverage. at the end of the work day, I look in the mirror, and feel more even in the undereye, sides of nose, and around the mouth. i'm not sure what will happen in the summer...but i'm happy with this combo for the cooler temps!